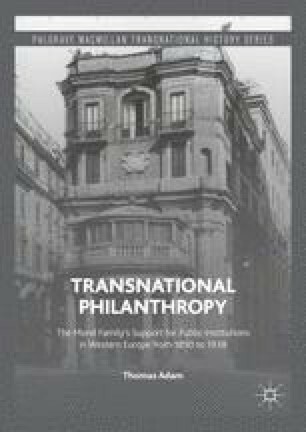 Philanthropy has been described by Francie Ostrower in her book Why the Wealthy Give as a behavioral pattern among members of the upper class that has been handed down from one generation to the next.1 There was, however, no guarantee, as the case of Sir Alfred Mond shows, that philanthropically engaged parents were automatically followed by philanthropically engaged sons. While Sir Robert Mond was introduced to philanthropy in his early twenties by his involvement with his father’s decision to create the Davy-Faraday Laboratory and to give it to the Royal Institution in the 1890s, Sir Alfred Mond’s involvement with his father’s philanthropic activities was limited to the division of Ludwig Mond’s art collection into the Mond Collection in London and the Hertz Collection in Rome as well as the donation of the Mond Collection to the National Gallery. And in these two different contexts, both sons developed very different attitudes toward philanthropy. Sir Robert Mond was happy to dedicate himself to equipping the laboratory, since he felt much more at home in a laboratory than in the factories of his father. And from philanthropic engagement in favor of scientific research, he moved into philanthropic support for something he considered his calling: archaeology and Egyptology. In contrast to his father, who felt comfortable in his role as a businessman and for whom art patronage became a leisure activity, Sir Robert Mond considered the life of a businessman as unfulfilling and instead sought satisfaction in the world of philanthropy, which paved his way into a career as an archaeologist. Sir Alfred Mond showed little interest in philanthropy and did not share his father’s and his brother’s obsession with supporting the arts, sciences, and archaeology. He did, however, consider the donation of his father’s art collection to the National Gallery as a useful instrument for advancing his own social ambitions. For him, politics and not philanthropy became a passion (Fig. 5.1).